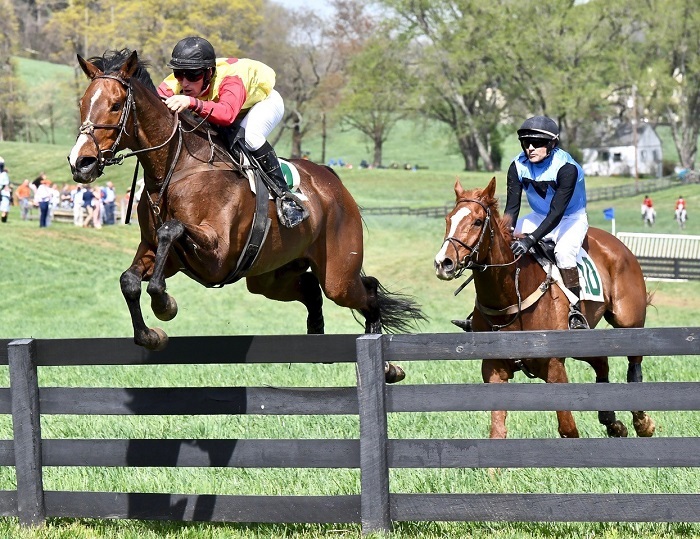 Senior Senator (Eric Poretz up) and challenger Monstaleur (Forrest Kelley up) at the last fence.Potomac MFH Skip Crawford’s Senior Senator won his third straight Grand National Point-to-Point—a three-and-a-quarter mile race over timber in Butler, Maryland—in a dominant finish to retire the challenge cup. The horse also has two legs up on the Maryland Hunt Cup and will be gunning to retire that trophy next Saturday in Glyndon. 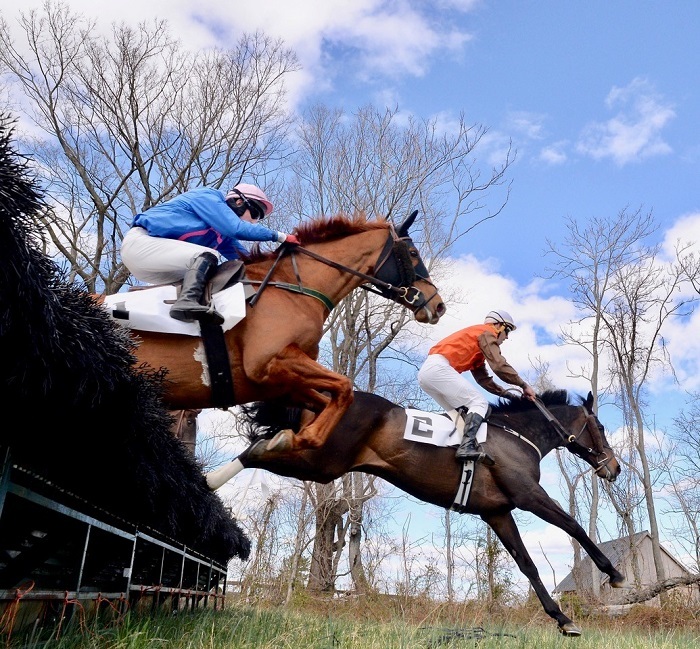 Steeplechase horses swish through the man-made national fences routinely at most hurdle races around the country today. 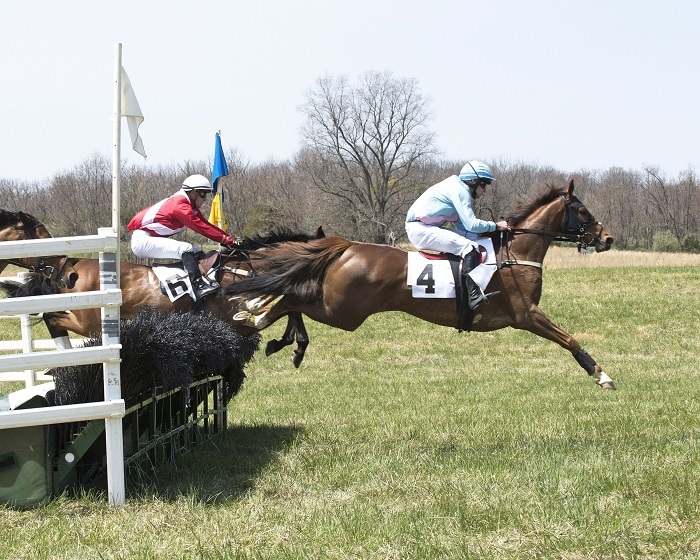 Brush fences were once expensive and time-consuming to set up, and racetracks were dropping steeplechase races from their cards. / Joanne Maisano photoIt was autumn of 1973, and the world was in turmoil. U.S. forces were pulling out of Vietnam, the Watergate scandal was rocking the nation, and a looming energy crisis was getting global traction. The steeplechase circuit, too, was in a state of flux. The year before, the bottom had fallen out of the industry. New York basically kicked out the jumpers and went from eighty-three jump races at Belmont, Aqueduct, and Saratoga in 1970 to fifteen in 1973. And those were at Saratoga only. 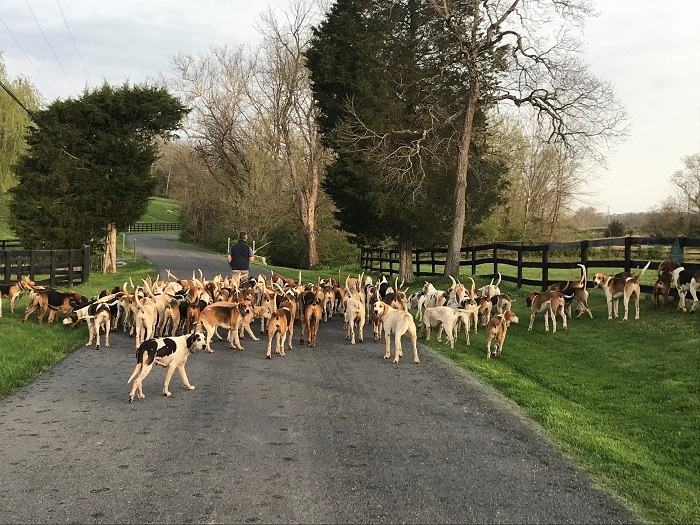 C’mon, Gotta Walk a Few Hounds.. / Sheri Buston photoIt’s a week and a half since huntsman John Harrison was suddenly faced with, then miraculously dealt with what could have been a horrendous outcome of that day’s electric storm. A bolt of lightning struck the power meter at the Deep Run Hunt kennels and the building burned to the ground. We’ve all heard how, with flaming shards falling from above, John was unable to reach hounds to free them from their pens. Needing another way in, he took a tractor to the perimeter and used the bucket loader to smash a way through, saving virtually all the foxhounds. The nightmare that ‘could have been’ was mercifully averted by John’s quick thinking and bold action. Mr. C. Martin Wood III, MFH, Live Oak Hounds (FL) has been line breeding his pack as he was taught by his late mentors, Captain Ronnie Wallace, MFH, and before that, Ben Hardaway, MFH. 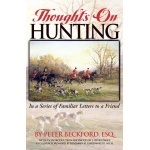 He absorbed the wisdom of both superb breeders, and, of course, brought some of his own wisdom to the kennels as well. We often hear the familiar and simplistic saw, ‘breed the best to the best, and hope for the best.’ That may work for some when first starting a pack, but there is another vital step that follows. Which of those ‘best’ are passing on their good traits, and which aren’t? The long-running male and female breeding lines in the successful packs are those lines started by superior hounds, the progeny of which continue to pass on their excellent genes generation after generation. Not all the ‘best’ hounds—or even racehorses—do. The author on Gus: muddied but unbowed / John Flavin photoDid you ever hear the expression “cheating death?” This question was posed to me by Bob Goodman, my newfound friend and fellow foxhunter, as we both emerged from one of those double drain jumps common to the south of Ireland. The question carried added meaning coming from Bob, a former Air Force fighter pilot with 336 combat missions in Vietnam. Maiden Hurdle race (l-r): #1, Apollo Landing (Bryan Cullinane up) finishes 1st; Leopard Cat (Paul Cawley up) places 2nd. 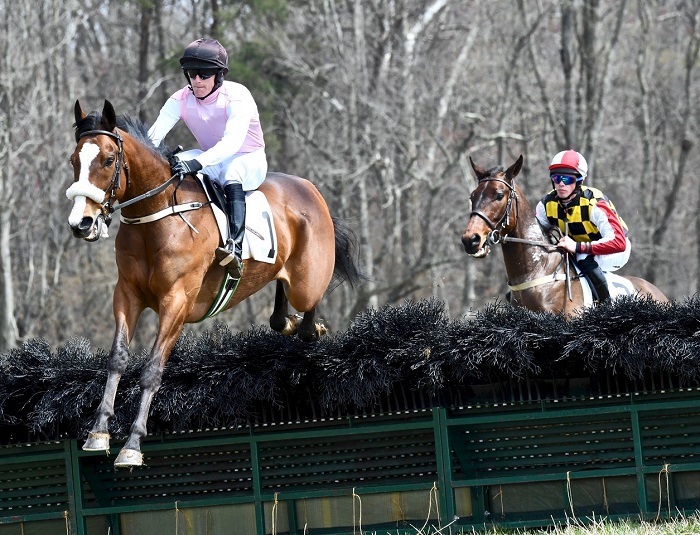 The trainer-rider team of Jimmy Day and Bryan Cullinane won four of the nine races carded at the Old Dominion Point-to-Point at Ben Venue Farm on Saturday, April 6, 2019. The Amateur/Novice Rider Hurdle (first race) was a walkover, and the rest of the fields were sparse, but Day and Cullinane won over hurdles, over timber, and on the flat. In the Maiden Hurdle, Cullinane took Charlie Fenwick’s Apollo Landing right out to the front and pulled away from Leopard Cat for the easy win. The light fades fast on a December day in the rolling chalk hills, the centuries-old beech woods, and the ancient countryside of the North Downs in the county of Kent in England. It is Roman country...old Roman country. The Roman presence can still be seen and felt there. Watling Street, now a motorway, was built by the Romans to conduct their chariots from the chalk cliffs of the coast at Dover to old Londinium. London today, of course. Straight as an arrow and solid as the rock foundations on which it was built. In places, you can still see the wheel ruts worn down by the centuries of travel. Here too, in the well-trodden countryside, ancient history's presence is felt as the Pilgrim's Way meanders through the landscape from Winchester to the Thomas Becket shrine in Canterbury Cathedral. Much of the route of the Pilgrims Way follows an ancient track dating back to 500 BC.